Imagine loving sports all your life, then getting a dream job with the NFL working for Steve Sabol. And imagine you can’t wait for the day when you can share it all with your son—until you find out that day will never come. I have four kids; my son Frederick is 13 years old, and has a diagnosis of autism and mental retardation. If you asked him his favorite athletes, he would say Elmo, Cookie Monster and the Count; those are his three favorite people and he doesn’t know what an athlete is. I’ve been with NFL Films for 20 years and been lucky enough to attend a dozen Super Bowls, but none with Frederick. He sometimes sits down to watch an Eagles game with me, but only for the purpose of waiting for a player to fall down or get tackled, and then he takes the remote and plays it over and over again. I love Frederick fiercely, and wouldn’t trade him for the world. But it’s different. 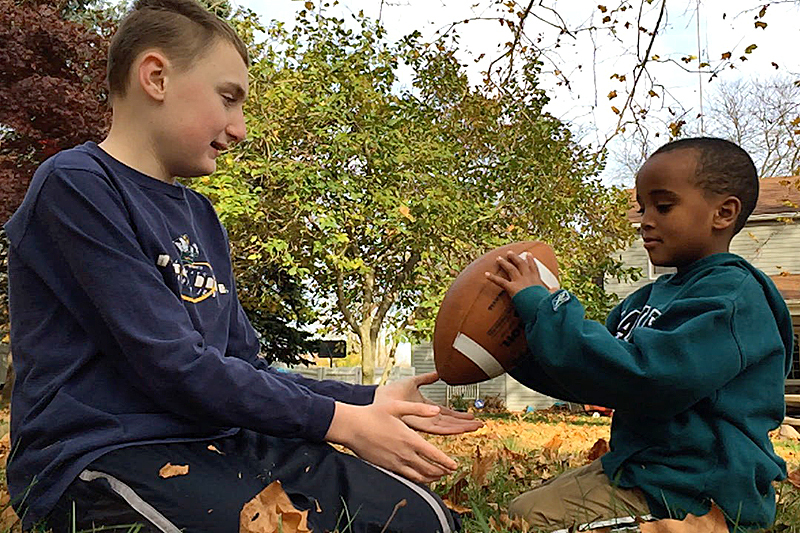 Frederick’s diagnosis wasn’t sudden; it was more like an 80-yard touchdown drive—one that ate years, not minutes, off the clock. I remember sitting in a TV truck in November 2003. ESPN was putting a microphone on a Broncos linebacker for Monday Night Football, and it was my job to be the NFL representative and “filter” what ESPN could use on the broadcast. I tried to do my job, but I was mostly thinking about our Early Intervention Specialist, a recent college graduate named Megan, who asked if she could visit with us, on her own time, the following weekend. During the Broncos-Patriots game I listened to the sound from the player microphones while also paying attention to the ESPN play-by-play and commentary in case they mentioned New England offensive coordinator Charlie Weis, whose daughter Hannah had autism. Would they say something about his daughter and her behaviors that reminded me of Frederick, igniting a fire in the pit of my stomach? Or would they mention something about her that was different than Frederick, which would make me breathe a 10-second sigh of relief, like exhaling after a long drag on a cigar? The game was memorable for a genius call by Bill Belichick; trailing late in the game with his team pinned deep in their own territory, the Patriots took an intentional safety. New England punted from better field position, held the Broncos, then scored the winning touchdown. But what I remember most vividly about that game is the relief I felt when they never mentioned Hannah on the broadcast. Back at work the next day, I couldn’t concentrate. There was a big party that night for the launch of NFL Network. I was involved in a lot of the preparation of the shows that filled those first few months on the air. I should have been celebrating. The commissioner was there. The hors d’oeuvres were hot. But I just stood apart, avoiding people, then left after a half-hour. For those of you fortunate enough to be unfamiliar with it, Early Intervention is a program that identifies children aged newborn-to-three who have a deficit in development. We lived in South Jersey at the time, and our county would send professionals to our home to work with Frederick. Megan had been his occupational therapist, visiting three hours each week for five straight months. The following Saturday, the wait was interminable. Because my wife, Bernadette, and I wanted to give Megan our full attention, we sent Frederick, his two sisters, and the dog to my mother-in-law’s. Our house was quiet. And cold. When Megan arrived, we sat down at the kitchen table. She began with a preamble, and I could tell she rehearsed it on the car ride over. She was 22, sitting at the table with two people 15 years her senior, faced with the task of delicately but forcefully telling them that it was time to wake up and smell the coffee. Her goal was to get us to take Frederick to a developmental pediatrician. She pulled out a formal-looking page from her bag and asked if she could read from a child development quiz, and then the three of us would discuss each question and come to a consensus on the answer. He didn’t know it, but Frederick was taking his first standardized test. As we trudged through the “Modified Checklist for Autism in Toddlers,” you didn’t need a medical degree to know which way the answer was supposed to go, and by my unofficial mental tally, Frederick was getting crushed. On more than half the questions, he was on the wrong side of the ledger. We sat there in silence, until I broke it. She was young, but mature enough not to take the bait. I adjusted the page so it was directly in front of me, square and level. The circled items were Nos. 2, 7, 9, 13, 14, 15. I slowly moved my finger across the page, from question to answer, not wanting to confuse or transpose anything. #2—interest in other children? No. #9—bring objects to you? No. I took a deep breath. 0 for 3, with three strikeouts. Not good. #13—Does your child imitate? No. #14—Does your child respond to his or her name? No. #15—If you point at a toy, does he look? No. Megan’s eyes began to well up. The first person to cry at the table and she wasn’t even the mom or dad. Were we that emotionally spent? Megan chose her words carefully. “No, he really doesn’t. Not specifically to his name. He responds more to the way you say it… like you could say any word in a calling voice and... what I’m saying is… if it was just a sensory problem, he’d be able to communicate...” Her voice trailed off. We thanked Megan for coming out on a Saturday, and we went about our business as best we could. I remember thinking that tomorrow was Sunday and I could watch some football and get my mind off it. And then I realized the Eagles were playing on Monday night that week. And then I wondered how I could ever enjoy watching sports again. A few months later, Bernadette and I were at the Children’s Hospital of Philadelphia, sitting in chairs meant for little kids in front of a matching two-foot high table. A physician’s assistant named Deborah was going over her report from Frederick’s evaluation, which had taken place two weeks prior. I was arguing some of her conclusions. She cut me off. At that moment, eight months of frustration and worry and fear finally settled in. Maybe, just maybe, my only son had some serious problems. I began drifting away. The rest of Deborah’s review seemed like it was off in the distance, like hearing people talk when you’re coming out of anesthesia. She left the room and returned with Dr. Susan Levy, the Head of Developmental Pediatrics at C.H.O.P. and a nationally recognized expert in Autism Spectrum Disorders. And then it hit me—it was game over. Dr. Levy was just coming in for the kneel-down. She introduced herself then told us her job was to interpret what the data meant. As I listened I wasn’t angry or sad, just desperate. She had yet to say the “A” word, but I knew it was coming. When she paused, I jumped in and tried to stall her. He’s a good kid. It was all I could think of. No medical relevance, just something that sounded like a last-ditch courtroom plea. Dr. Levy paused and looked down, as if to compose herself. Picture the fuel gauge on your car. It arcs from “E” Empty to “F” Full, with little notches in between. The needle rests somewhere between the two. That’s a good way to picture autism. Autism is a “spectrum” disease, meaning that a person diagnosed with autism can be so severely affected that he’s non-verbal and self-injurious (down near the “E” on the gauge) or so mildly affected it’s hardly noticeable to an untrained eye (the needle is up near “F”), or be anywhere in between. One year after Frederick’s formal diagnosis, I produced the open to Super Bowl XXXIX for NFL Films’ “Game of the Week,” which meant I was responsible for the first five minutes of the show that led up to kickoff. It was my job to tell the story of the teams and set up the characters and storyline. I was looking through the pregame footage from the 20-plus cameramen we had at the game and I came across a shot of the Patriots’ Tedy Bruschi cavorting with his three young sons on the field, hours before the game, well before all the players and pregame entertainers turned the gridiron into a circus. They were racing, playing, and frolicking like ponies. At one point, Tedy lay down on the grass, and his kids jumped on him. We had the shots from a few different angles, including some trademark NFL Films slow-motion clips. The look of pure joy on Bruschi’s face was priceless. I started weeping, then shut my office door so no one could hear me. After a half-hour, I finally composed myself then sat down to edit again. I watched the footage for a second time. Now, instead of sorrow, I felt anger. I hated those shots. It was a no-brainer to use a few of them, but it hurt too much, so I finished the open without them. 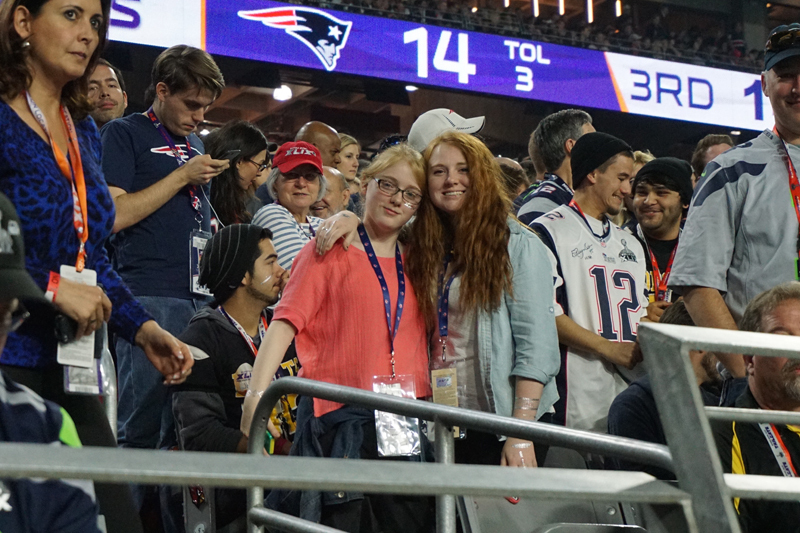 But then my boss, Steve Sabol, stopped by for a few minutes to ask how the show was going, and as he was leaving my office he said “How ’bout that shot of Bruschi’s kids, huh? You should work those in.” So I had to use it. I was barely seven years old when Hank Aaron broke baseball’s all time home run record. I was asleep when my dad came up and told me. He let me come downstairs and watch the replays and the all pomp and circumstance on the field. The images of Aaron rounding the bases and getting mobbed at home plate are still vivid in my mind, but I honestly don’t know if those memories are from that night or from seeing the replay a hundred times in the 40 years since. Really, it doesn’t matter. The most important memory from that night isn’t the home run; it’s that my dad came and got me. Frederick and I have yet to share a sporting moment like that. But I can't complain; I’ve had a great football life. The sport has always been my passion, and now it's my livelihood. When I was a senior at Notre Dame, we won the national championship. I’ve gone back for games several times since and my classmates often have their kids with them. I’ve brought my oldest daughter. But never Frederick. When the Eagles went to the Super Bowl in 1980, I was Frederick’s age. I remember it like it was yesterday. A few years ago I produced a show on Reggie White and Jerome Brown, a dream come true for a Philly guy. My best friend’s son watches it all the time at his house; it’s been on the TV in our house a few times as Frederick wandered by with his iPad, disinterested. I sometimes get wistful, knowing that Frederick is at the age when we should be arguing about Chip Kelly’s master plan or whether the Seahawks should have run the ball on the last play of Super Bowl XLIX. 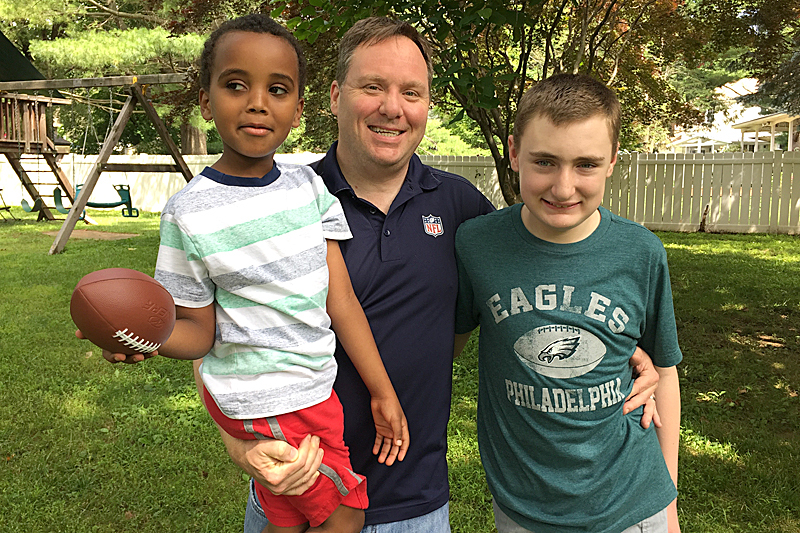 A few years ago, we added to our family when we adopted a boy from Ethiopia. Julian is six now, and he’s starting to get it. He knows when football season starts. My two daughters aren’t that into football, but that’s O.K. Anna played field hockey, and Grace runs cross-country. They think I have a cool job, especially after attending last year’s Super Bowl. Frederick has never been to a game. Since he resides on the lower end of the autism spectrum, he can be a real handful in situations outside of the home. Specifically, his sensory issues sometimes overwhelm him and he can become almost unmanageable in crowded places. But this year, we finally made it to the Linc. 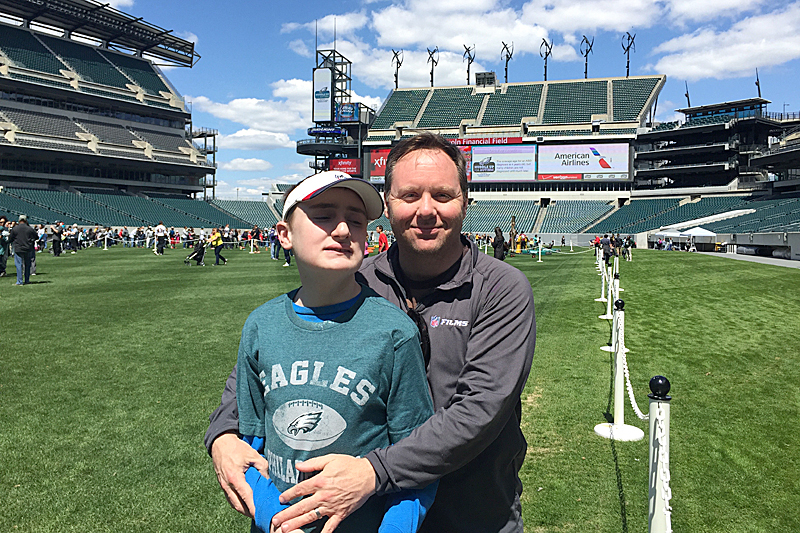 The Philadelphia Eagles host an annual Huddle Up for Autism event that benefits Children’s Hospital, and I took Frederick. He got to dance with cheerleaders, saw Swoop the mascot, and even attempted a field goal. But he kept asking when the game was going to start and I had to explain, over and over, that this was a carnival and there wasn’t going to be a game that day. He wouldn’t let it go. After an hour, he went into full meltdown mode, and we left. But the day wasn’t a total loss. He said he wanted to see a game. I plan on taking him to a real Eagles game this fall. And when I do, that will be our Super Bowl. Adapted from the memoir I Thought Pointing Was Rude, represented by William Morris Endeavor. Digger O’Brien is a five-time Emmy Award winning senior producer at NFL Films. He lives with his wife and four children in Bucks County, Pa. Follow him on Facebook at 4SpecialDads.